Caldwell’s Facebook memo to collectors has appeared on www.sportscollectors.net and throughout hobby forums. He brought up great suggestions. 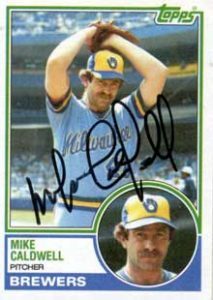 Caldwell has reasonable rules for TTM autographs. Besides, anyone who’ll keep signing for free, stating out loud that collectors don’t need to enclose money, should be given extra attention. One request that caught my eye first was Caldwell’s wish that collectors stop using envelopes you have to lick. Don’t forget that www.baseball-almanac has a huge collection of autographs. Each signature is displayed on each player’s personal page. My first concern was the empty envelope. Anyone who’s gotten an empty SASE knows that special disappointment. What might have been inside? Did someone not get the memo on how a self-sealing envelope works? Sure, the self-seal SASE will be more expensive. But, once it is sealed, it stays sealed. Readers, please let me know what type of envelope you prefer using. Have you had problems with the other kind of envelope? Harmon Killebrew + Uppity Ump Humble Chicago Hurler Ken Frailing! His sig still makes every letter count! Pitcher Ken Frailing shared a sly sense of humor with me in his thoughtful reply. 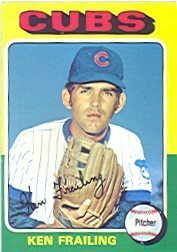 While Frailing didn’t have the longest career, he spent it all in Chicago, going from the White Sox to the Cubs. I asked how it felt being part of the four-person deal to obtain legend Ron Santo on Dec. 11, 1973. “Ron Santo was, and is, an icon in Chicago. We had met a few times. He was a great guy as well. Frailing wasn’t an exclusive reliever for his new team. On May 27, 1974 (with thanks to http://www.retrosheet.org/), the lefty compiled an unusual complete-game win against the Giants at Wrigley Field. While he wasn’t the day’s most mystifying moundsman, Frailing put on a show at the plate: three hits and three RBI. “I had a nifty 14-hitter and a complete game. I threw 158 pitches in that game. “Baseball was a great part of my life. I really enjoyed my time and the memories are priceless. Example: my major league debut in old Yankee Stadium. It doesn’t start any better than that. Let me share one story from my career. 1972 — Chicago White Sox. I am pitching to Harmon Killebrew. I got 1 ball, 2 strikes and throw a breaking ball over the heart of the plate. The umpire calls it a ball. I knew where I stood in the scheme of things. Thanks for your interest. May God bless! Tomorrow: Happy 57th baseball anniversary, Tom Bradley!